Mars will make its closest approach to Earth since 2005 on Memorial Day (May 30), presenting a prime viewing opportunity for skywatchers. Look low in the east-southeast sky on any clear evening soon after darkness falls this week, and you'll see a fiery, yellow-orange "star" blazing brilliantly. Named for the Roman god of war, Mars is often called the Red Planet. But anyone who takes even a casual glance will see that it's more like a yellowish orange, the color of a dry desert under a high sun — which is exactly what you're looking at. On May 22, Mars arrived at "opposition" — the moment when the sun, Earth and Mars form a straight line in space. When a planet reaches opposition, it lies exactly opposite the sun in the sky from Earth's perspective: It rises at sunset, reaches its highest point in the sky at midnight and sets at sunrise. If you envision the solar system as a giant racetrack, Earth is moving in the inner lane. Mars comes to opposition when the faster-moving Earth overtakes and passes the outer planet. Red Planet opposition occurs about every 26 months. But because of Earth's and Mars' elliptical orbits, not all oppositions are created equal. Because Earth and Mars follow elliptical orbits around the sun, Mars' closest approach to Earth usually occurs several days before or after opposition. On May 30, according to calculations by Belgian astronomer Jean Meeus, Mars will come within 46.78 million miles (75.28 million kilometers) of Earth at 5:35 p.m. EDT (2135 GMT). At that time, a light beam will take 4 minutes and 11 seconds to cross the interplanetary gulf between Earth and Mars. This year brings Mars closer to Earth than it has come since the fall of 2005, and the next opposition bringing Mars even closer will not occur until late July 2018, when it will be 35.78 million miles (57.59 million km) away. That 2018 opposition will be superior to this year's because Mars will also be approaching its closest point to the sun, called perihelion, when it arrives at opposition. Such "perihelic oppositions" of Mars are infrequent, occurring about every 15 to 17 years. Recent perihelic oppositions saw Mars approach Earth to within 35.1 million miles (56.5 million km) in September 1956, 34.9 million miles (56.2 million km) in August 1971, 36.5 million miles (58.7 million km) in September 1988 and 34.6 million miles (55.7 million km) in August 2003. In fact, in 2003, Mars arrived at perihelion just a scant 42 hours after its opposition. It was the closest Mars has approached Earth in nearly 60,000 years. 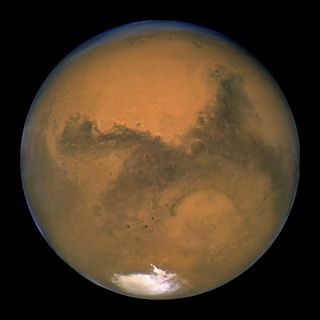 On Monday evening (May 30) at 5:35 p.m. EDT, Mars will be the closest it has been to Earth since Oct. 5, 2005. Take a look at Mars this upcoming week, and then try to imagine what Mars will look like at the end of July 2018. Believe it or not, it will then blaze at a magnitude of minus 2.8. That's more than twice as bright as this week's Mars, and through a telescope, it will appear nearly25 percent largerthan it appears now! There is a long-term cycle of 79 years in which the circumstances of any particular Mars opposition will replicate almost exactly. This year's apparition, for instance, is nearly a duplicate of the opposition that occurred on May 19, 1937. On Aug. 22, 1924, Mars made nearly as close an approach to Earth as in 2003. And on Aug. 30, 2082, Mars will make another exceptionally close approach to Earth, though it will fall just short of matching the 2003 approach, by just 78,487 miles (126,313 km). Editor's note: If you snap an amazing photo of Mars and would like to share it with Space.com and our news partners for a possible story or image gallery, send images and comments to managing editor Tariq Malik at spacephotos@space.com.